Born on a strawberry farm in country Victoria, Wil graduated from high school at the early age of 16 and went on to La Trobe University to study Media and Literature. Deciding that wasn't for him Wil took off a couple of years to travel and work odd jobs. This adventure led to a wide and varied career path including cook, hay bailer, food critic, waiter, paver and personal assistant around Australia. With his mind made up of what jobs he didn't want to do, Wil auditioned for NIDA on his return to Australia. He graduated in 2002. His passion for acting began in high school when he and his friends spent their time making short films. His creative mind had him playing varied roles from a werewolf to a psychopath, winning short film festivals for cinematography and directing. Wil's resume to date includes NIDA plays The Treatment with Director Mark Gaal, Pericles - Prince of Tyre and television guest roles in White Collar Blue and Macleod's Daughters. 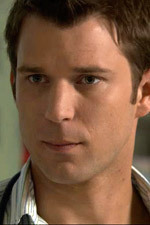 Wil also starred in the mini-series, Jessica. In his spare time Wil loves to play golf and has just taken up indoor rockclimbing. The ease with which Jack Quade's medical career is blossoming is a pleasant surprise to him. It has not always been easy. He comes from a working class background, a tough mining and steel town where his father, Peter, still works as a fitter and turner. Jack's father brought him up on a diet of uncompromising honesty, swift kicks up the bum and terrible cooking. Jack's mother ran off shortly after his eighth birthday and hasn't been heard from since. The youngest of three boys, Jack ended up doing a lot of the kitchen duties but somehow still manages to enjoy cooking. Both Jack's brothers, Dave and Neville, became policemen and their kid brother might well have followed them into the force if Neville hadn't almost been killed in a petrol station hold up. Jack opted for a less dangerous career and one which might serve his brothers well if they get into any more strife. At twenty-five, Jack is good looking and younger than his responsibilities would seem to dictate. Despite taking his work and patients very seriously, has a healthy disregard for authority and can sometimes seem to be lacking in propriety. He has a great sense of humour.